What is Biofibre implant used for? Biocompatible hair (Biofibre) is a hair implant, a soft medical procedure suitable to address male and female baldness or as a hair thinning remedy. 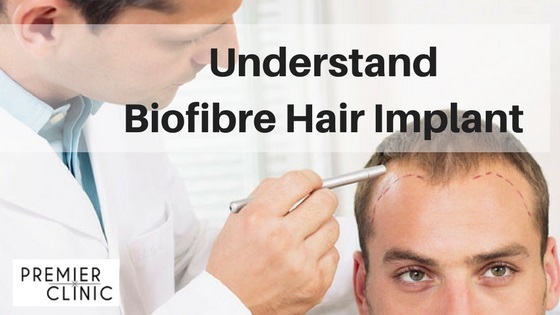 In the procedure, Biofibre hair will be implanted to cover the bald area or increase (thicken) hair in the affected area. Is Biofibre hair implant suitable for both men and women? Yes, Biofibre hair implant is a hair loss solution suitable for the treatment of hair loss in men and hair loss in women. What is the prerequisite for the Biofibre implant procedure? The rule is that every implant can only be performed on healthy scalp. What are the features that make Biofibre Biocompatible Artificial Hair suitable for implant? Biofibre hair loss treatment fulfils all biocompatibility and safety requirements set by the International Standards on Medical Devices. The procedure can only be performed by a qualified and trained Physician, by using an automatic hair implant device or manual instruments and Biocompatible Approved Artificial Hair on selected patients. How is the Biofibre Hair Implant procedure performed? The implant is a simple light surgery performed by using an automatic hair implant device or manual instruments. The procedure will introduce the Biofibre hair one by one to produce a more natural result. The process will continue until the desired hair density is achieved. Usually, 800 to 1,500 hairs are implanted per session. If the patient desires a greater density in a shorter time, they can consider Medicap High Density (MHD) hair. MHD hair can provide a triple volume of hair outside the scalp. For example, 3,000 hairs are obtained by implanting 1,000 fibres. How many Biofibre hairs are required to correct generalized hair loss? Approximately 2,500 Biofibre hairs are adequate to obtain a satisfactory aesthetic result. For a greater density, Medicap High Density (MHD) hair could be a more suitable option to be considered. Can female patients have long fibre implants? Yes, Biofibre hair is available in three different lengths, which are 15 cm, 30 cm and 45 cm. The fibres are also available in various shapes, such as straight, wave, curly and afro, to satisfy all the patients’ preferences. I have blond hair. Is Biofibre hair available in blond colour? Yes, Biofibre hair is available in more than 13 colours as well as white to cater to all patients’ preferences. Special colours are available on demand. Biofibre hair looks identical to natural hair. Just like taking care of natural hair, patients should take care of their Biofibre hair too. They should maintain their Biofibre hair with Biofibre® Hair Care Set products. Will Biofibre hair lose their colour or break like natural hair? Biofibre hair will not lose their colour. However, patients must take care not to attempt to dye their Biofibre hair with aggressive products. Biofibre hair is very resistant and will not break. The final fixing of implanted Biofibre hair is completed 20 to 30 days after the implant procedure is performed and will remain unchanged for a long period of time. Biofibre hair implant procedures performed with the automatic hair implant device can be repeated every 15 days, in different areas. However, if the Biofibre hair implant procedure was done using a manual implanter, sessions can be repeated every 4 weeks, in different areas. The duration of the aesthetic result obtained with a Biofibre hair implant varies from patient to patient. It depends on the correct management of the post-implant period. Literature reports that the aesthetic results will last for an average of 7 to 8 years with progressive fibre loss of approximately 10% per year. There is a natural loss of fibres, approximately 10% per year. Can a new Biofibre implant be performed to regain the same aesthetic result? Yes, a yearly implant touch-up will be performed to compensate for the yearly loss in fibres as a standard practice. Can I have a Biofibre hair implant after autologous hair transplantation? Yes, it has become a regular practice today for hair transplant physicians to use Biofibre hair implants when required to increase the density of hair implanted with an autologous hair transplant. The Biofibre hair implant procedure can be performed after the cicatrization of hair transplant is achieved. Can I have a Biofibre hair implant during therapy with Minoxidil and Finasteride? Yes, many dermatologists today implant artificial Biofibre hairs simultaneously with dermo-trichological therapy. To stop the local therapy for several days after implant until cicatrization is achieved is suggested so as not to sensibilize the implanted area. Is Biofibre hair implant suitable for eyebrows? Trials of Biofibre hair implants for eyebrows are currently running. There are difficulties associated with this kind of implant due to the sensitive nature of the implant area. Spaced hair implant and a very small quantity of hair is suggested, but more data must be collected before eyebrow implants can be safely offered. Is Biofibre hair implant suitable for total alopecia? Total alopecia is not the main focus of this Biofibre treatment because of the very large number of implants required, but thanks to a new generation of Biocompatible hair (Biofibre) and new triple hair (Medicap High Density hair) several male and female cases were treated and documented with very encouraging results. I wear a wig. Can I have a Biofibre hair implant? Yes, but Biofibre cannot replicate the same number of hairs in the wig and the final result will be different. The implantation with Biofibre hair starts from the nape, then the portion of wig corresponding to the implanted area is eliminated from time to time, as the newly implanted area must always remain free to be rapidly healed. Interested to know more about Biofibre Treatment? Contact us today! Find out our latest aesthetic promotions!